During his younger years, John Apperson was living the picture of a perfect life. He and his wife had settled down in Michigan where John owned a trucking company. He worked to support his family and when it came time for his three children to attend college, he proudly paid for their education. “I had a good life,” John says, reflecting on his past. Years later, after some encouragement from his brother, John moved to Arizona. He had high hopes for Arizona’s job market and was eager to enjoy the warmer weather. But what happened to John after that move changed his life forever. In 2001, John was involved in a serious car accident that left him in a three-month coma. He was thrown from the driver’s seat after a semi-truck hit his car. The accident left John disabled. He lost an eye, had his jaw reconstructed, endured severe head and knee injuries and was diagnosed with diabetes and cirrhosis of the liver. Despite this experience, John persevered and found a retail job in Phoenix — but the accident had left its mark. John was no longer able to stand for long periods of time, and due to the arthritis in his hands he had to take frequent breaks during shifts. Eventually, John lost his job because the company needed him to work more quickly than his body was capable of. John’s job loss meant that he could no longer afford the rent for his apartment. Because of his rapport with his landlord, John was told that if he could find a way to pay rent again, he would be welcomed back in to his apartment. But fearing eviction, John packed up his Lincoln Town Car and left. For two weeks he slept inside of his car at a truck stop parking lot, unsure of what to do next. Then John found St. Vincent de Paul. John actually discovered SVdP by accident. A woman in a local park who was experiencing homelessness told John about SVdP and the services offered. After working with Veterans Affairs, he was referred to Ozanam Manor. Ozanam Manor is a transitional shelter located on St. Vincent de Paul’s Watkins campus in downtown Phoenix. It houses men and women who are 50 years of age or older or disabled. 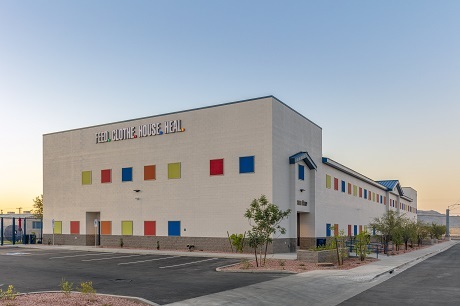 Different than a daily shelter model, where guests leave for the day and return in the evening, Ozanam Manor houses residents through their transition from experiencing homelessness to finding permanent housing. 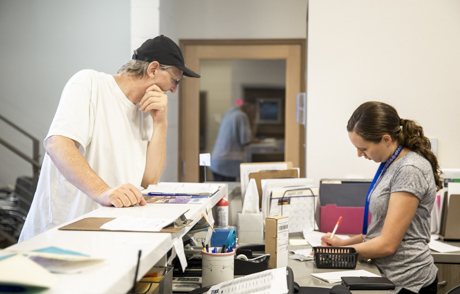 Case managers help residents navigate medical and legal barriers and coach them on basic living and job skills so they can become self-sufficient. “They go out of their way every day to try to help people,” John says of the St. Vincent de Paul staff. John has been a resident of Ozanam Manor since November of 2017. 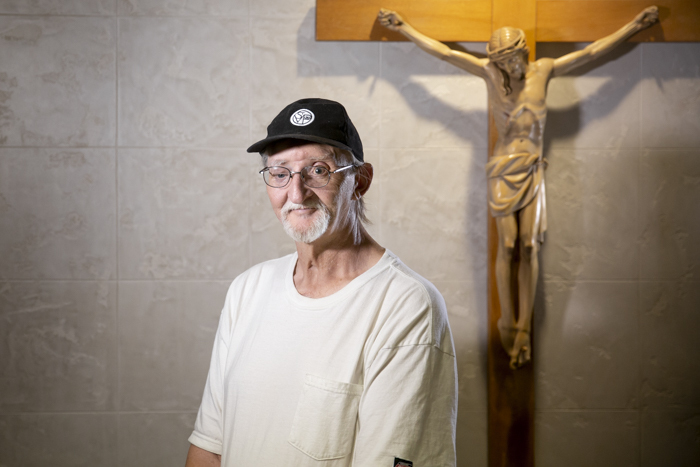 He is one of the occupants who has seen Ozanam Manor’s transformation first-hand, initially living in the old Ozanam Manor facility before moving into the new shelter when it opened in May. The new Ozanam Manor has 60 beds, expanded from 49 in the old building, and includes reserved spaces reserved for veterans. In addition, one of the four dormitories is reserved for women. The new campus is across the street from the main campus at 420 W. Watkins Rd. John recalls a feeling of awe when he moved in to the new facility. He couldn’t believe how clean and welcoming the space was. In the time he has been a resident, John has received much of the help of which he was in desperate need. The Ozanam Manor staff has helped him attain Social Security Disability Benefits and assisted him with housing applications. John also received new dentures and medical care from SVdP’s Virginia G. Piper Medical and Dental Clinic. In late August, John finally was able to purchase a motorhome and is moving out within the next month. “If I can get my AC and security done on my trailer, I'll be out in two weeks,” John said the day after buying the vehicle for $2,000. When asked where he’s planning to move, John responded “by a lake,” without hesitation. “I’m gonna go fishing.” While grateful to Ozanam Manor and SVdP, he is eagerly awaiting self-sufficiency and independence. Despite all life has thrown at him, John remains positive. “My ambition in life is to figure out why I can do this,” he says as he wiggles his nose and smiles. “[I am] not taking for granted what they offer us here. Anybody that gets an opportunity to come in here from the homeless side, I don’t know how you can go one day without saying ‘thank you,’” he adds.